With network integration a pervasive part of everyday life, it's no longer good enough for your appliances to simply function well. If you can't manage them wirelessly, then you're not keeping up with the technological Joneses. 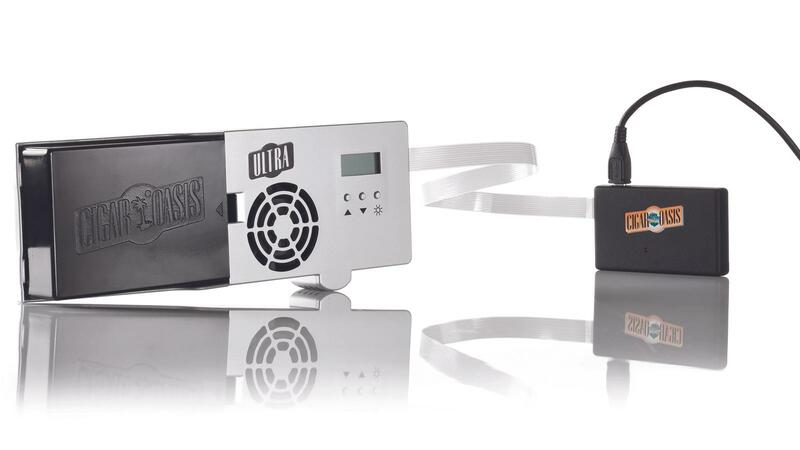 So it isn't surprising that cigar humidification should be joining the 21st century with the Smart Humidor from Cigar Oasis. The WiFi unit ($119) attaches to the company's humidifiers and allows you to not only monitor the conditions of your humidor from a mobile device, but also to do some resetting. While checking on your humidor's relative humidity level by smartphone isn't terribly new, actually being able to change the level is. The Smart Humidor's app-based WiFi system can incrementally raise or lower humidity all from your iPhone, smartphone or whichever iOS- or Android-based wireless device you use for mobile apps. If words like WiFi and mobile app scare you, not to worry. The steps are fairly easy and you can have your system up and running within an hour of opening the Smart Humidor box. Physical installation is easy and the Smart Humidor WiFi set-up is practically plug and play. The system can be used in any humidor (desk or cabinet size) as long as you install one of Cigar Oasis's self-contained humidification devices. The Ultra 2.0 ($119) is pictured here. That device includes a digital hygrometer, motorized fan and small push-button controls to manually raise or lower humidity, and it mounts to the inner lid of your humidor. A flat ribbon cable, which won't crimp when you open or close the box, connects the humidification device to the WiFi unit outside the humidor. If you can get used to the site of a single ribbon cable running from your humidifier and snaking out the back of your humidor, you'll find the conveniences outweigh the specter of the wire. You download the free app, connect to your local WiFi network and set up an account with Oasis to register one or several humidification devices on its website. The app then provides all the current vitals of your humidor in real time. The bedewed history of your humidor will even be plotted on a graph to show any fluctuations in humidity. Most importantly, you'll have the ability to change your settings at will. The controls are user friendly and self explanatory. In the event you get caught up actually doing something in the physical world and forget to check your phone, the Smart Humidor will send you texts when water levels get dangerously low.